Have you seen these things inside of your grocery store? They are awesome! 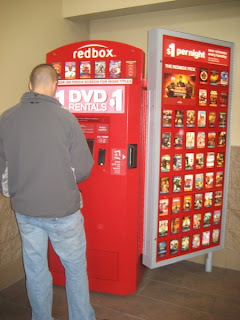 Basically it is a vending machine for DVD's and it is only $1 per night! Which is cool because you usually watch the movie the same night that you rent it, and they have new releases! I think its great and even better if you go to redbox.com and enter in your email address you will get a code for a free rental! Enjoy your free movie!